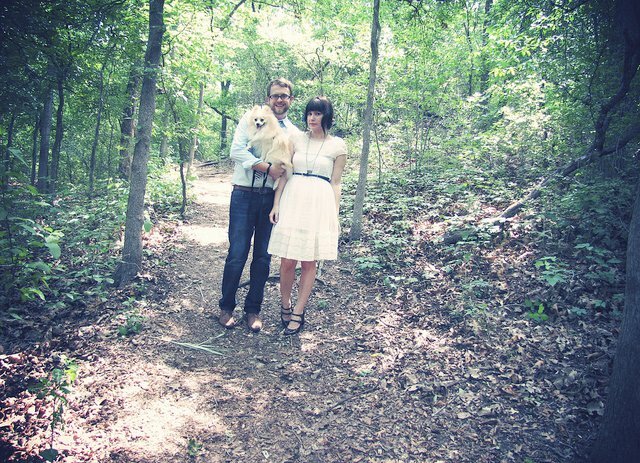 We adore Lost in Drawers, an online vintage boutique, and the owners Heather and Bo Liles. We had an opportunity to chat with the husband and wife team to get the scoop on their business and their personal styles. R&R: What kinds of items catch your attention for your online store? Heather and Bo: Anything we think has “good bones,” meaning something that is highly dated that we can transform with modern tailoring. We try to be very selective in thrift stores as there are a lot of things that are old enough to be vintage but not all have that wearability we are looking for. We want to offer items that customers can bring into their wardrobe and fit it with everything else they love. Nothing is worse than a really good dress that just sits in the closet and doesn’t go with anything! We want things to be absolutely wearable–from the grocery store, to the movies or a night out. Currently, we have been focusing on finding dresses that fit this mission statement, because we have found that there is a need for frocks you can throw on and that will make an instant and unique statement! R&R: What inspired you to start a business? 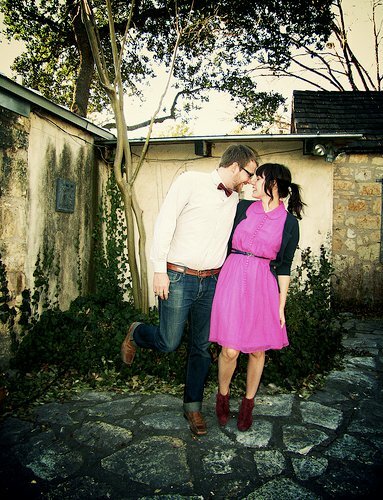 Heather and Bo: We know there are a lot of vintage businesses both online and locally. Our business was born out of our love of vintage and the reality of life on a budget. Lost In Drawers Vintage exists because we feel that there are other people like us who want quality, wearable vintage clothing that works with all the clothes in their closet. We believe in and love every item we sell, and want that to translate to the customer. If we think it won’t work for any client, we won’t sell it. Every decision we make in our business is geared towards having the best customer service possible. Our business is more than just a business. It is a passion that we share. We want everything that we touch to have a purpose, from the clothes themselves, hand written thank you notes, to the packaging it arrives in to our customers, and to our efforts to making a difference in our community. 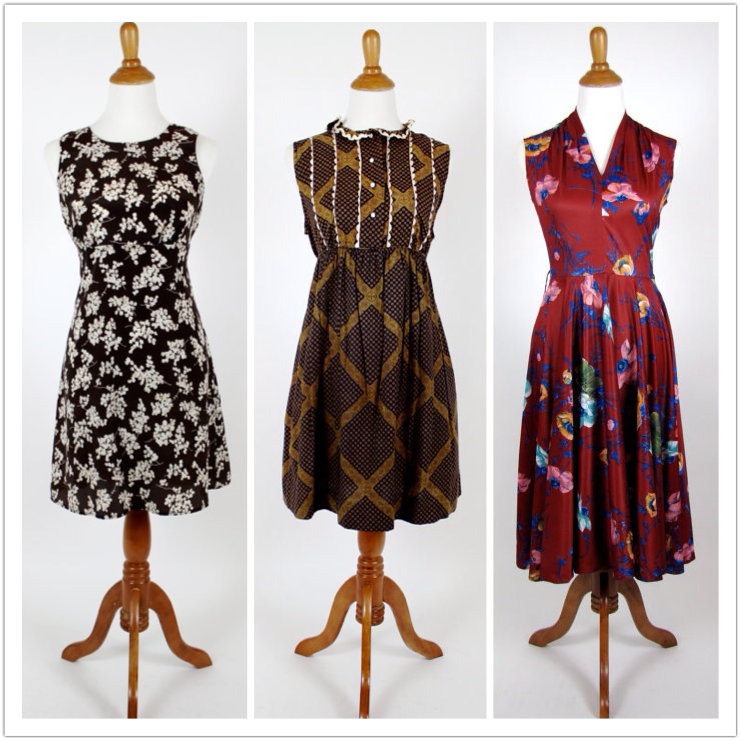 A few of our favorite dresses that are currently on sale in the Etsy shop. R&R: Any advice for anyone aspiring to start a business? We can’t emphasize the importance of being kind to everyone you come in contact with. Kindness goes a long way. We recommend reaching out to others around you who are passionate about the same things, as there are always things you can learn from others. When starting a business, finding and fostering community is one of the best things that can help you personally and professionally. Community is key to growing any industry. It is better to do what you love alongside others, than trying to go at it alone. Don’t rush! Take your time, as getting all the details the way you want them makes running your business a lot more rewarding. Constructive suggestions and advice from others can be really good things! 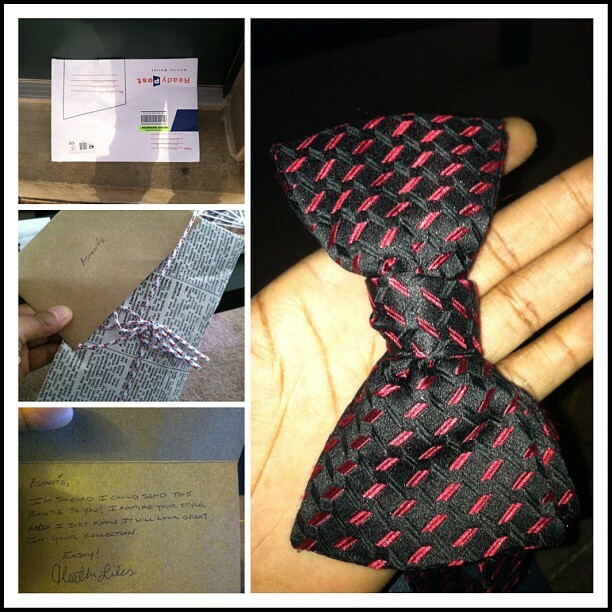 Heather knows Reese loves bowties, so she sent this gift in the mail….a vintage Neiman Marcus bowtie! R&R: Let’s switch gears a bit. How would each of you describe your personal style? Heather: I naturally gravitate towards all things vintage, retro and something that looks like it has a story. I stepped into my first thrift store when I was 15 years old. It was incredibly freeing, knowing I could make up my own style and afford to buy my own clothes. I embraced that I could have a unique style, even when mall brands and jeans and t-shirts were all the rage. I’ve never stopped vintage shopping, and my style now is all about making vintage fit my wardrobe. I like bold statement pieces, I stock up on versatile items I can wear a hundred different ways, like a dress I can wear as a skirt or tucked in as a top. I seem to never get enough good hats, full skirts and high waisted anything which comes from my love of the early 1960’s and pre-disco 1970’s New York. With my style, I try not to take myself too seriously as fashion is a way to be creative and fun. Bo: My style is evolving constantly, in part due to Heather’s influence. Needless to say, there are less band t-shirts and hoodies and a lot more cardigans and button downs. I gravitate towards Americana, with an emphasis on quality and workmanship. I am more aware of tailoring than I ever was before, to the point I am always looking for items to replace what I have because I want a better fit for my frame. I love a selvedge denim jean, a slim cut shirt, a good leather shoe and a tweed jacket. I am a collector as well, and I tend to end up with handfuls of vintage designer neckties and armfuls of cardigans. I am most excited to see were my style will take me in the next few years. R&R: Any advice for aspiring thrifters? Heather and Bo: Number one rule? We try to be kind to the employees at our regular thrift stores. If you treat theirs store with respect, the employees will take care of you. Second, TRY THINGS ON! Fit is paramount. The best looking dress or top in the world won’t work if it fits poorly. Thrifting is such a de-stresser for me (Heather). Take your time, get some food first, and have an open mind. Most everything can be fixed. Buttons can be re-sewn, stains removed. I love the idea of turning something old into something new. For example, making a long, matronly skirt shorter and modern or transforming a dress with huge puffy sleeves into something chic with a cap sleeve. This idea of transforming something takes time, but when going through the racks, I look at every single dress or skirt. Your patience and willingness to be selective will be rewarded. Heather and Bo with their adorable dog, Emory. Heather and Bo, thanks for sharing with us. We love the items we’ve gotten from you. Your love for your business shows in your excellent customer service. We wish you success in your business and happiness in your everyday life! Categories: Uncategorized | Tags: small business, vintage | Permalink.